This work was drawn on the lithographic stone by Jaques Villon, under Bonnard's supervision. It is one of eleven lithographs, executed in this way, at the studio of Louis Carré, Paris, between 1942-1946. Villon's drawings were after gouaches by Bonnard and Bonnard followed the progress of the work through every state, annotating the colours and making numerous marginal notes. Signed l.l. 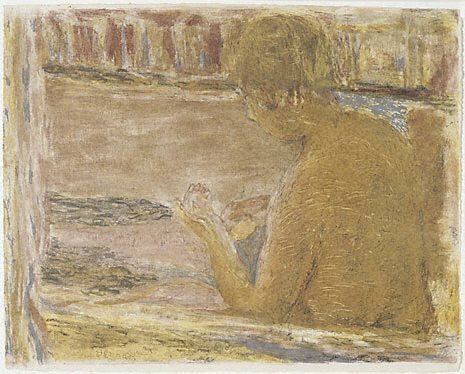 [inscribed on stone] "Bonnard" and l.r., pencil "PB". Not dated. Bonnard: The Complete Graphic Work , England, 1981, 300, 310 (colour illus. ).